International Journal of Current Research in Biosciences and Plant Biology ISSN: 2349-8072 (Print), ISSN: 2349-8080 (Online) is a multidisciplinary peer-reviewed journal with reputable academics and experts as members of its Editorial Board. The Current Research in Biosciences and Plant Biology aims to publish all the latest and outstanding research articles in the field. The journal is intended to publish high-quality articles, in English, in all areas of Biosciences and Botany. 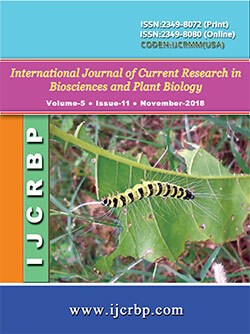 The journal publishes novel research and review articles in the fields of Biosciences-diversity, Ecology, Embryology, Physiology of Animals, Plants and Microorganisms, and their interactions; Agricultural Science, Biochemistry, Bioinformatics, Biomedical Sciences, Biotechnology, Environmental Sciences, Clinical Sciences, Food Science, Environmental Sciences, Microbiology, Pharmacology, Soil Biology and Waste management and other related aspects of biosciences. The Plant Biology aims to publish research articles in Phycology, Mycology, Systematic Plant Biology, Biodiversity & Conservation, Cytology & Genetics, Ethnobotany, Economic Botany, Morphology and Physiology of Plants, Medicinal and Aromatic Plants, Palaeobotany, Phytogeography, Plant Tissue Culture, Phytochemistry; Pharmacognosy and Pharmacology of Medicinal Plants, Plant-animal, Plant-plant & Plant-microbe interactions, Plant breeding and Botanically related areas. •Biochemistry •Bioresources •Biomedical Sciences •Bioinformatics •Chemical and Structural Biology Flora and Fauna •Genetics •Immunology •Cellular Microbiology •Medical Microbiology •Industrial Microbiology •Soil Microbiology •Microbial Genetics •Microbial Ecology •Biotechnology •Pharmacology •Cell Biology •Histology •Developmental Biology •Food Science •Nutrition and Dietetics •Natural Products •Genomics •Marine Biology •Molecular Biology •Parasitology •Pharmacogenomics •Physiology •Population Dynamics •Proteomics •Systems Biology •Zoology. IJCRBP is designed for the prompt publication of peer-reviewed articles in all aspects of the subject. The journal articles will be accessible freely online. All manuscripts are pre-reviewed by the Editor, and if appropriate, sent for blind peer review. Contributions must be original, not previously or simultaneously published elsewhere, and are critically reviewed before they are published. Manuscripts submitted to the IJCRBP, are peer reviewed, initially reviewed for contents, suitability and technical aspects. A minimum of three reviewers related to subject is required for each manuscript. IJCRBP publishes original articles, short communications, letters to editor and reviews monthly. A manuscript number will be e-mailed to the corresponding author normally within 48 hours.